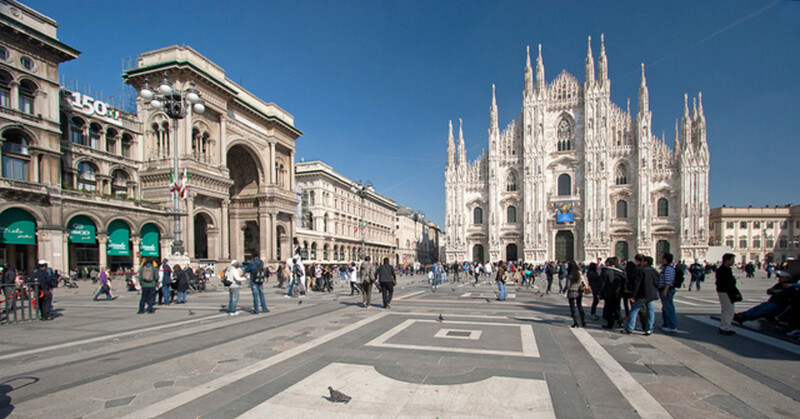 It perhaps needs no explanation that Piazza Duomo in Milan is known best for its Cathedral. 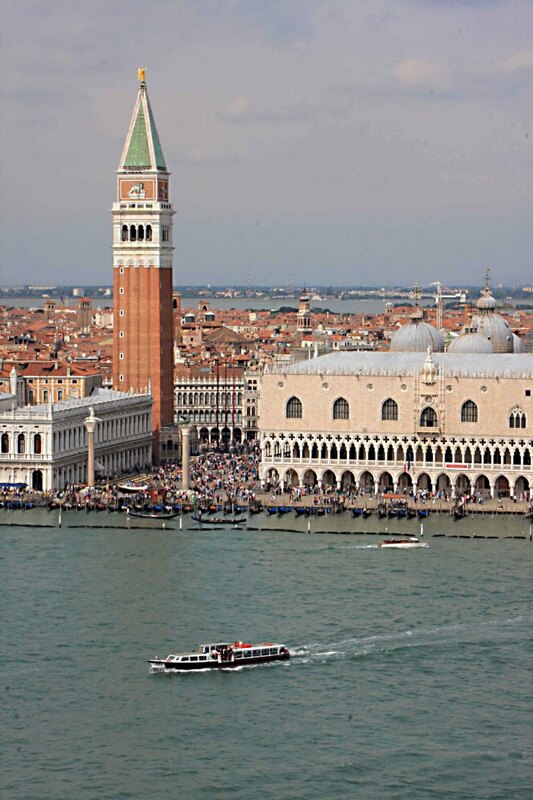 Hence the naming of the square since 'Duomo' is the Italian word for Cathedral. But this focus on the dramatic presence of such an incredible religious monument steals some glory from the surrounding buildings. But that is only just for some of the 'palazzi' living in its shade right in the heart of the city. 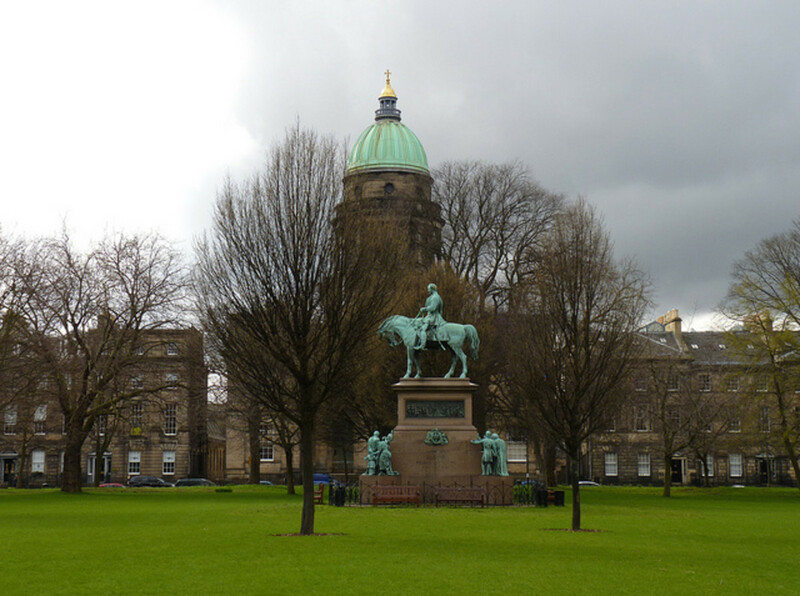 As you will find from this virtual tour of the square the other buildings are a varied mixture. Nevertheless no matter how ancient, antique or modern, whether magnificent or mediocre the buildings of Piazza Duomo are also worth exploring. 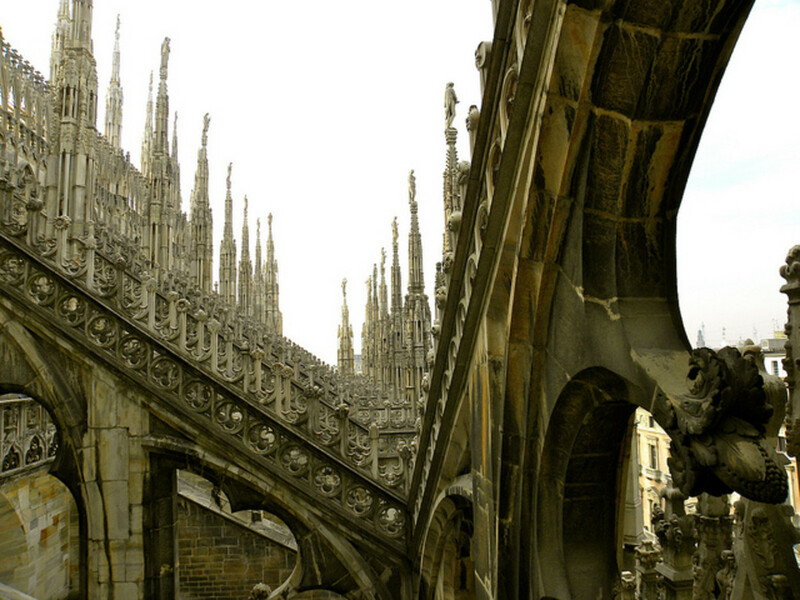 The Gothic spectacle of the Duomo clearly dominates the square and has done for over 600 years. 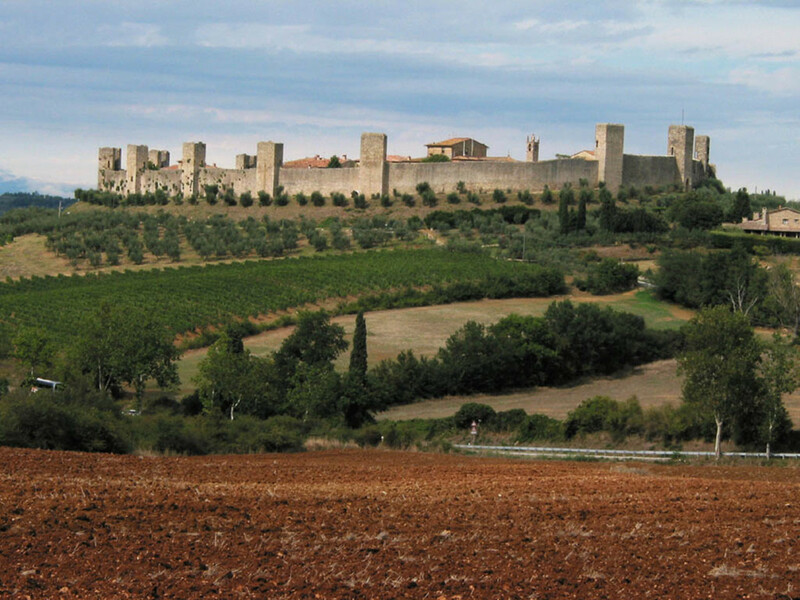 Work began in 1386 to be exact and it was not officially completed until 1965. During this time a canal was specially built to transport the stone from the faraway quarries. Rock from Lake Maggiore in the north was used to excellent affect to create this spectacular building. At its highest point it reaches almost 150 feet with a multitude of gothic statues and complicated carvings embellishing its vertical structure. 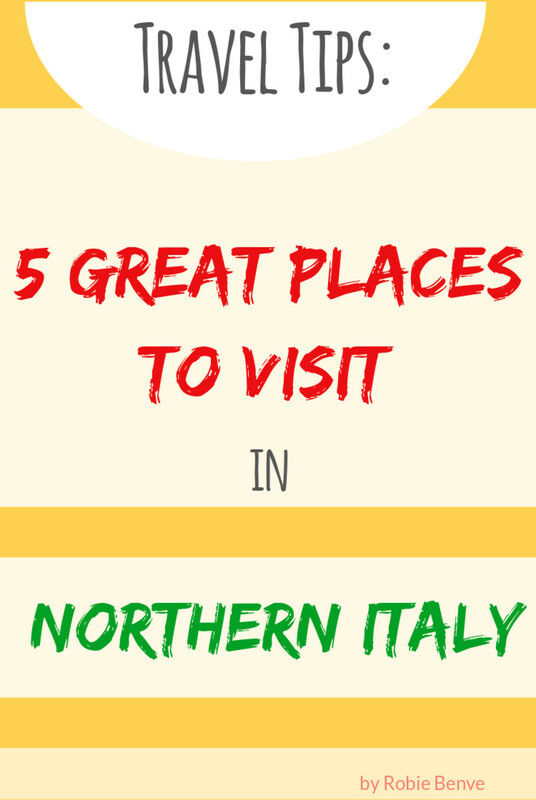 It is free to enter although for a price you can take the lift to the rooftop and see the statue of the Madonnina which gazes down on the square and over the city. 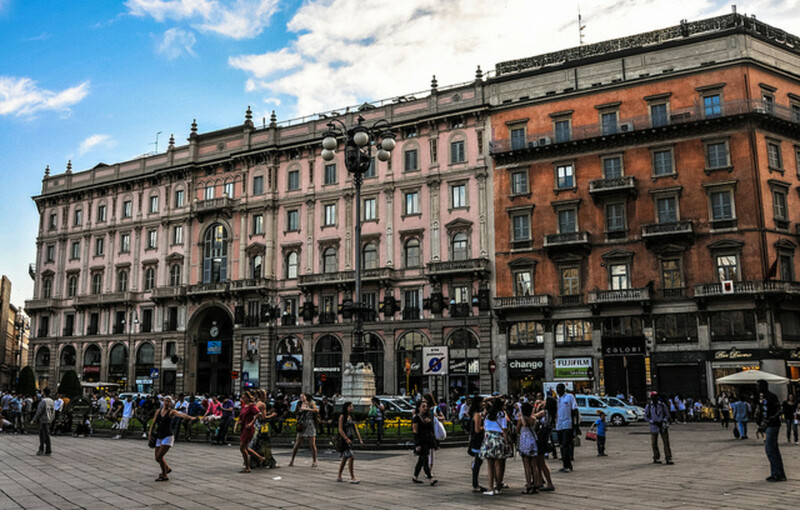 But what of the rest of this central showpiece of Milan? Let us take a clockwise tour around the nearby attractions around the perimeter. At the main entrance to the Piazza are two buildings standing on opposite sides reflecting against each other in a mirror image. The Palazzo dei Portici Settentrionali on the north side and the Palazzo dei Portici Meridionali on the south were built to the same design by Guiseppe Mengoni in the 1870's. The Piazza Duomo underwent a major transformation at that time. The latter side of the square boasts the added archway of the entrance to the Vitrio Emmanuelle II shopping arcade whilst the latter must simply rest on its own merits. At street level curved archways offer an elegant invitation into the shade from hot summer suns and protection from winter rain. In both palazzi they merely entice you to window-shop or perhaps enter inside to offer your custom. The southern building enjoys more protection from the sun for most of the day but the stone work suffers accordingly. The northern twin exudes a brighter hue being nurtured by the natural light. Both buildings are shaped in the neo-classical style with pink and white stone. These are upheld by Corinthian pillars and decorated by the romance of an array of Shakespearean balconies. 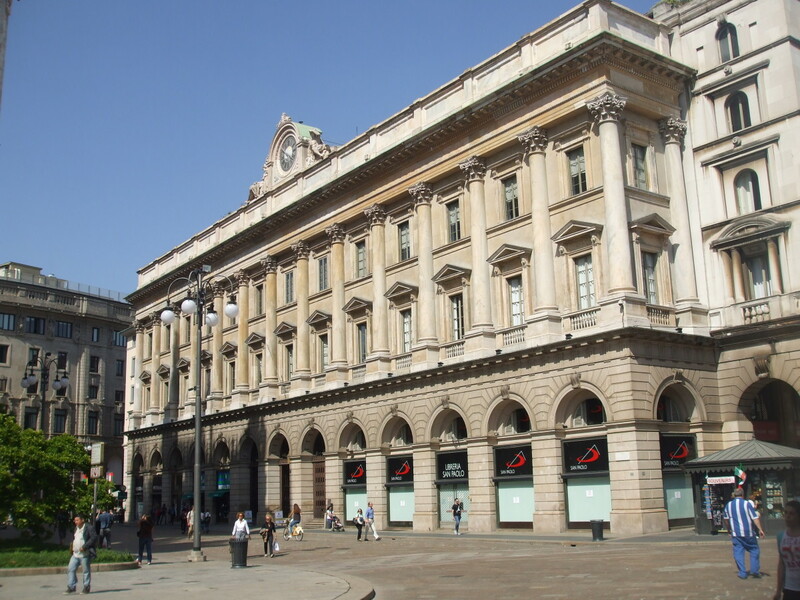 Continuing along the north side we arrive at the imperious Vittorio Emmanuelle II shopping arcade. With its expensive stores and cafes it is a monument to high-class retail and expensive refreshment but nonetheless the architecture is superb. The soulless malls of the modern western suburbs would genuflect in humility. In fact a McDonalds restaurant was ousted from the arcade in 2011 and replaced by a Prada store. 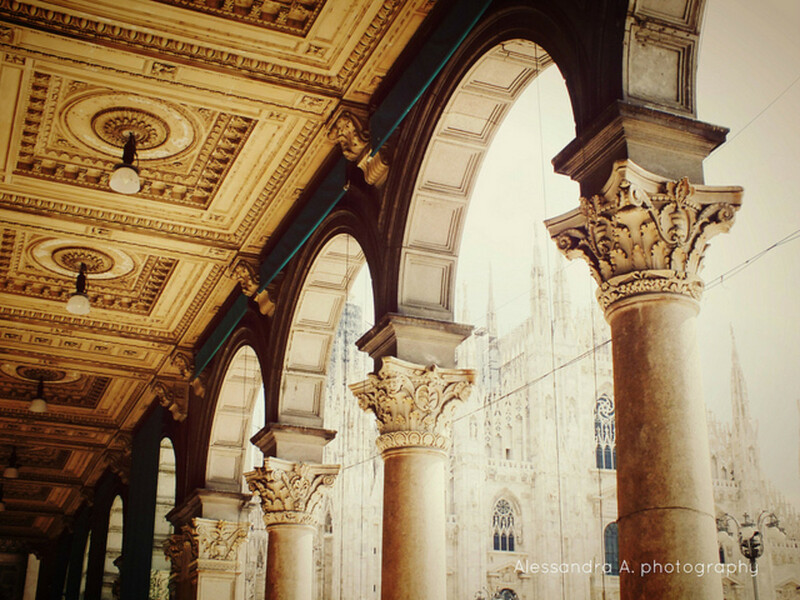 The arcade is named after the leader of the 'Risorgimento' the 19th century Italian Independence wars. 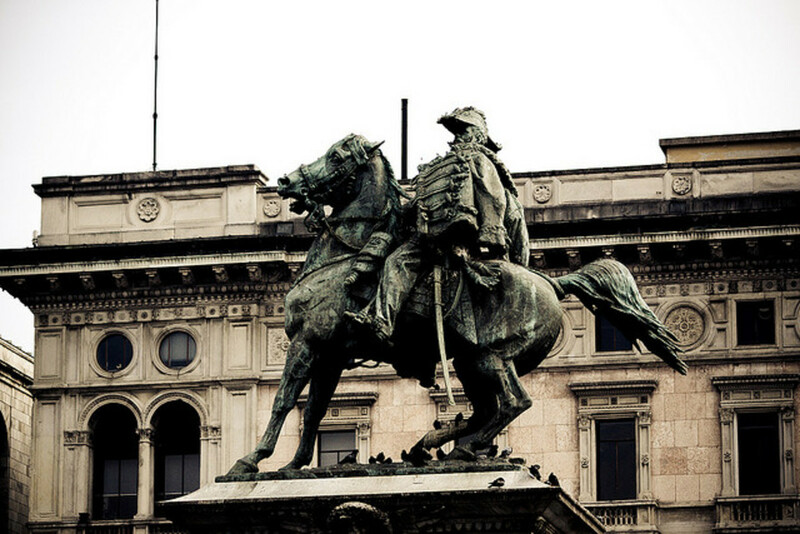 He was King Vittorio Emmanuelle II and there is also an equestrian statue of him at the mouth of the Piazza. This statue was unveiled in 1896 and the 'vietato salire' sign deters admirers from climbing on top although this does not apply to the many pigeons around with the obvious freedom to roam the airspace. 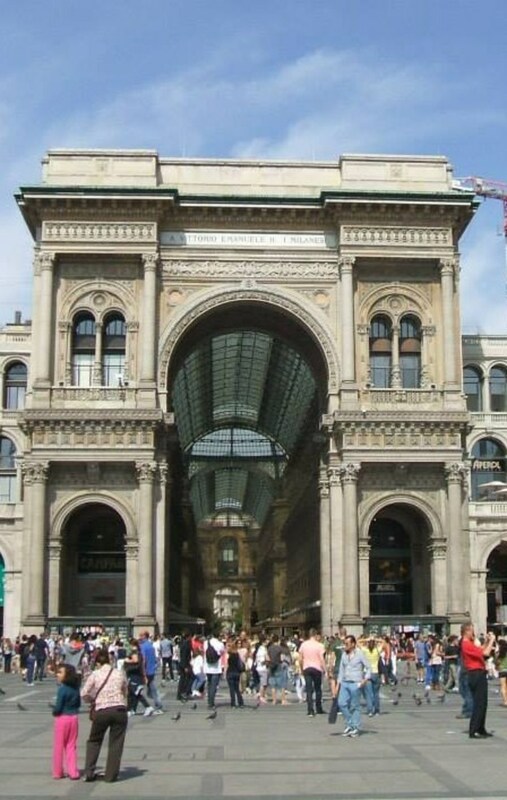 It is however much more difficult for our feathered friends to enter into the Vittorio Emmanuell II arcade as a huge net covers most of the magnificent entry. The portal is reminiscent of the grandeur of the Parisian Arc De Triomphe and its heavily ornate and opulent presence imposes itself onto the square below. In fact it would perhaps be more fitting as the entrance to a royal palace or a seat of government rather than a mere shopping centre. However it is a permanent obituary and testament to the 19th century architect Mengoni who tragically died falling from the roof near completion in 1877. As for the square itself it has to be admitted that it can be almost impossible to relax in Piazza Duomo. Underneath is a massive Metro station with a constant flow of commuters and travellers entering and exiting at several points on the square. The area is flooded with sunshine in the hot and humid summers and is normally full of locals, tourists and the pestering street hawkers. The latter are a feature all year round selling the unsellable in stark contrast to the luxury items under the arches. The square is very open and accommodates large crowds for political rallies, rock, pop and classical concerts. The front of the square around the statue is enhanced with lawns and flower beds and attractive streetlamps light up the area at night. Dotted around are stalls selling souvenirs or snacks to eat, such as hotdogs or ice-cream, depending on the season. Returning to the architecture we pass the Vittorio Emmanuelle II arcade and come to an altogether different 'palazzo' in both age and design. The building 'La Rinascente' was a hybrid of old and modern around the time of its construction in 1950. But even the classical flourish on the ground floor is muted and stripped down with its prosaic archways lacking the grace of the previous structures. Above the ground floor the mood turns even more puritan with a solid block of marble devoid of the intricacy of the artisan. The architect of this mid-century powerhouse was Aldo Molteni with fine interior work by Carlo Pagani. Comfort returns at the next structure where the warmth of the aged familiarity of the past welcomes the visitor. This building is truly natural and organic with a worn and weathered appearance. It is built of cream-coloured stone populated by multi-faceted decoration and is the home of retail outlets and offices. At street level ionic columns support the upper floor and carvings of lion faces gaze fiercely outward like petrified guardians. However the aggressive spirit is mollified at the top floor where you will see female figures beautifying the facade. In winter the view will be accompanied by the pleasant aroma of street food concentrated in the narrow confines of the north-east corner. Fresh roasted chestnuts crackle in nearby stalls offering atmosphere and solace from the cold. On the east side behind the Duomo is a hidden secret of the Piazza. What initially appears from the outside to be apartments above the shops actually contains a church on the inside. 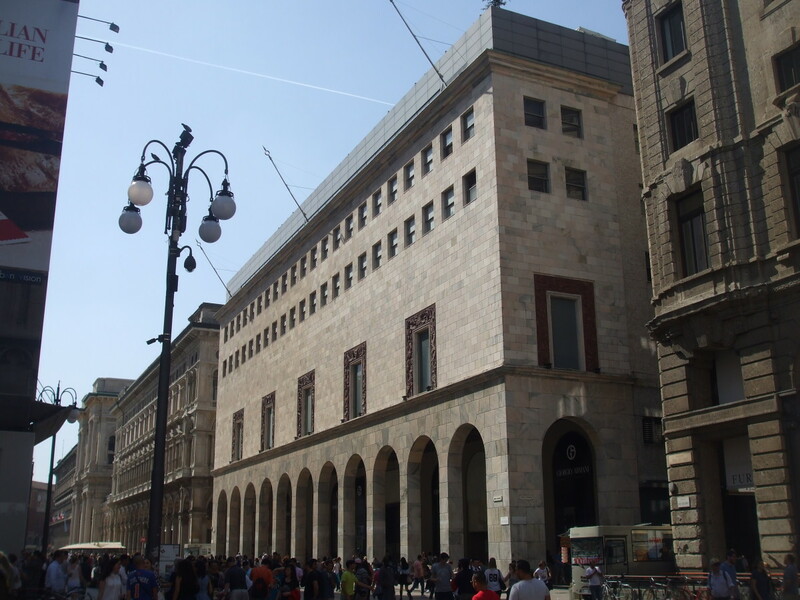 This building is the 'Palazzo della Veneranda Fabbrica del Duomo' named after the factory of craftworkers responsible for the Duomo. 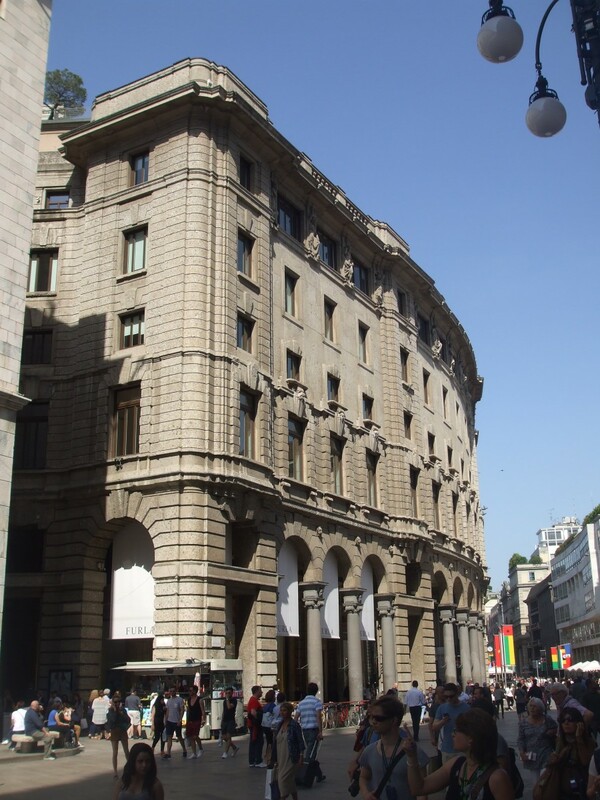 The Palazzo itself was opened in 1853 and designed by architects Pietro and Guiseppe Vandoni. Look closely at the centre of the building and on the ground floor you will see dark gates of iron. This is the entrance to the Church of Santa Maria Assunta which lies disguised behind the secular facade. 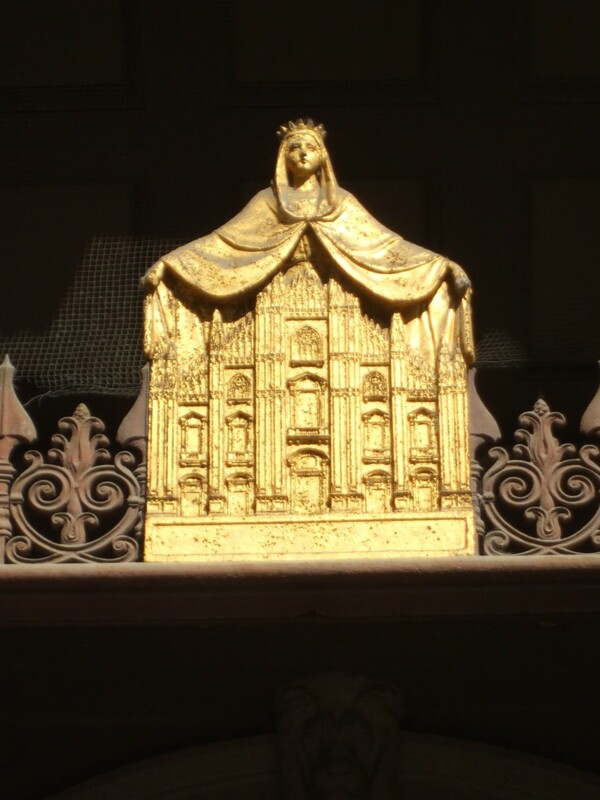 There is also a beautiful golden emblem above the gates depicting the saint protecting the Duomo. Along the frontage of the Palladian facade of the Veneranda Fabbrica are many marble pillars. Again, they have capitals in the intricate Corinthian style and also with more carvings of lions. The latter are indicative symbols of the old Venetian Republic which once ruled the north of Italy. The most impressive feature, however, is high above as it is perched on the roof. There sits a pediment with a large clock flanked on either side by reclining, romanesque figures. This was added in 1865 and is a notable finishing touch to a grand building. Palazzo della Veneranda Fabbrica del Duomo on the east side of the Piazza. In the habitually shaded southern section of the Piazza the architecture travels back even further in time. The 'Palazzo Arcivescovile' is a juxtaposition of original brick and renovated plaster walls. The pleasant red colour of the brickwork on the upper floor is shored up by the more contemporary cream painted walls on the first two floors. The older sections of the building date from the early 15th century with a courtyard designed in 1604 by Pellegrini Tibaldi. Age has taken its inevitable toll on the older surface material of the building. Only a few remants of some of the adornments now remain. However the damage and decay only serve to strengthen the sense of history and the passage of time. Nevertheless the exquisite curvature around the windows still remains intact. 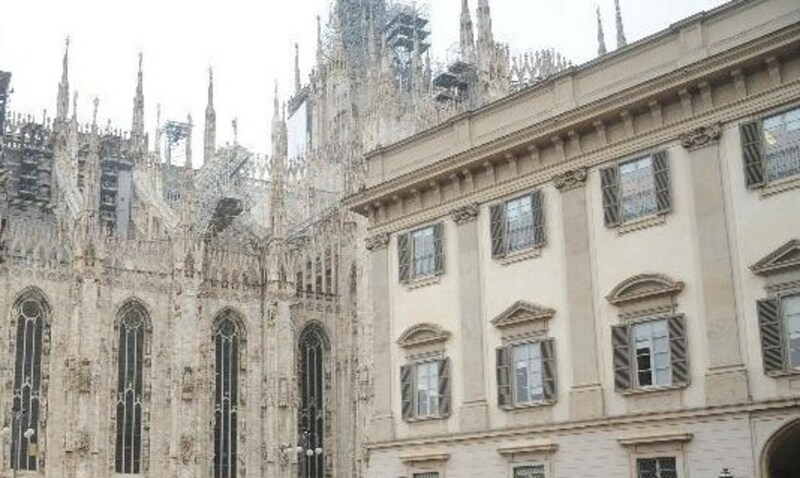 Plus the frontage also contains a carving of the symbol of Milan. This is 'Il Biscione' which is a man-eating serpent. The imagery is said to represent the concepts of power and eternity. 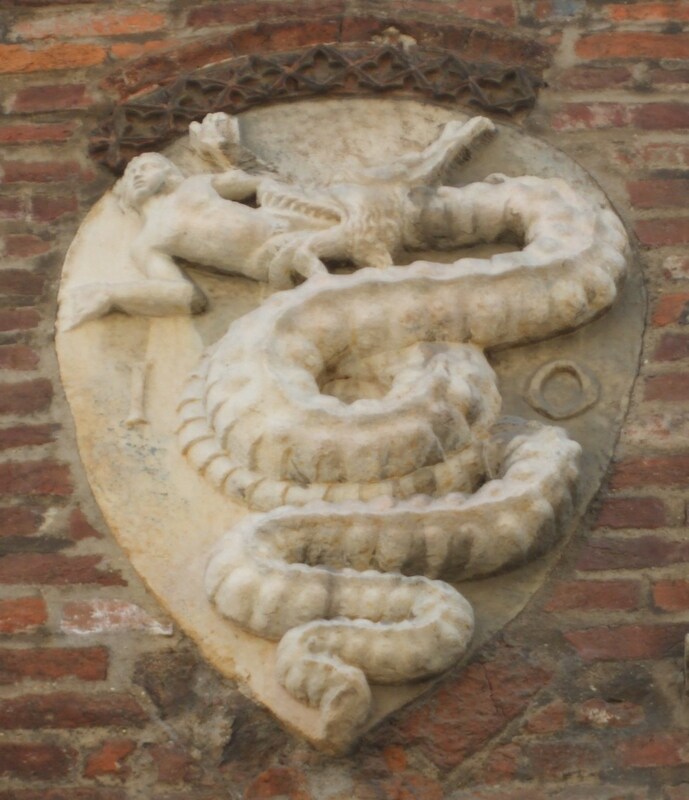 It was an heraldic symbol of the powerful Visconti family from the 11th century. 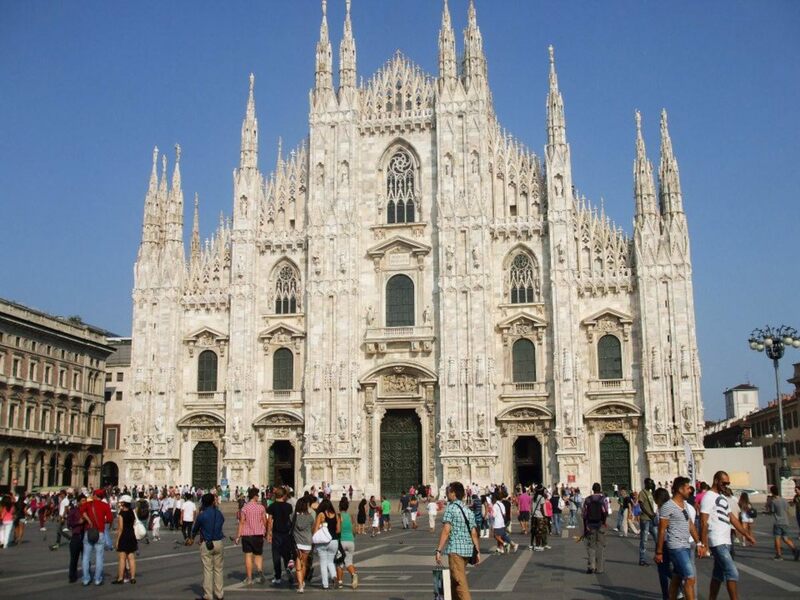 They introduced it to the city when they took control of Milan in 1277 and it has remained ever since. Undoubtedly the least impressive architecture in the Piazza belongs to the south-eastern corner. The Museo del Duomo consists of three floors of windows and shutters in an altogether mundane style. It was opened in 1953. The interior is sure to be of more interest as it contains artefacts and documents pertaining to the Duomo itself. You will discover many sculptures, paintings, stained-glass, tapestries and architectural models. The exterior though is simply an absolute counterpoint to its majestic superior on the opposite side. But banality descends into mediocrity as we turn into the grounds of the former Town Hall. A plain facade with pilasters attempting to lend some classical grandeur fails to impress. 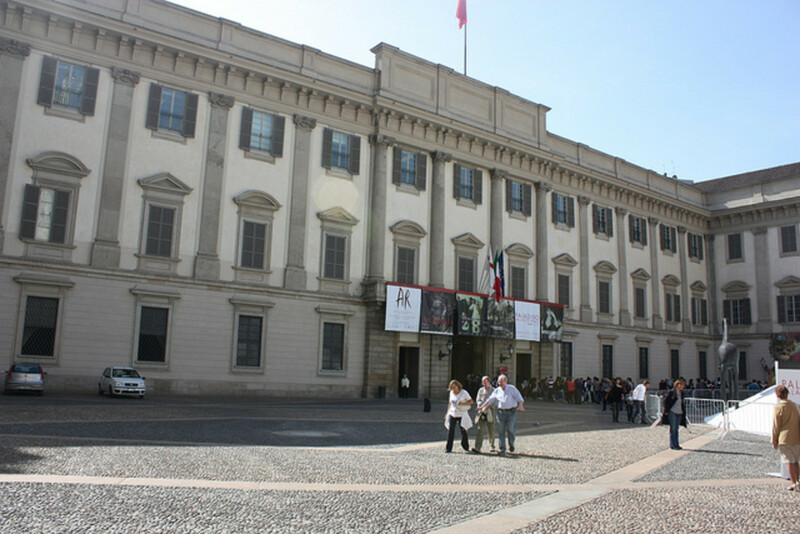 Even its official name of Palazzo Reale or Royal Palace cannot raise its quality. The current building was the result of a re-design by Guiseppe Piermarini in the late 18th century. He also introduced the open space in front that is embedded with pebbles and which proves hard on the soft-soled visitor. Thankfully there are flat paved paths criss-crossing the rough terrain. The ground-floor windows are all barred which betrays a lack of confidence in the security of the area. However the main entrance is open and leads to a courtyard which equals the facade for underwhelming design. Although there is a very pleasant bar left of the archway tunnel if you feel like a break from the hot weather or the dreary architecture. The ultimate saving of the building is the interior designs which have been restored. Plus it holds temporary exhibitions of prestigious art from around the world which attracts many visitors. The next building is far more interesting and unusual within the context of the Piazza. 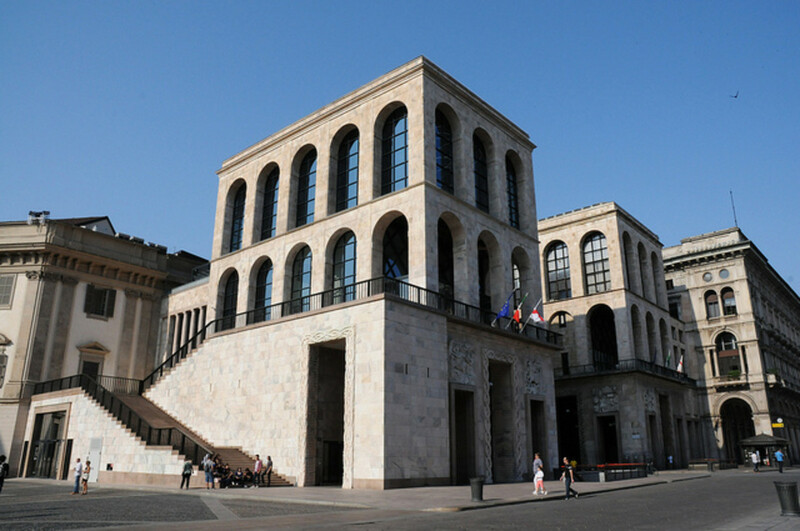 It is the Museo Novecente. A facsimile of ancient times with its monolithic style and large windows it basks in the early morning sunshine. It is related to the verb 'arringere' which means 'to address' as in the sense of making public pronouncements from a balcony. Construction of the original building began in 1936 when the word 'Arengario' was in vogue once more under the Fascist regime of Mussolini. Work was disrupted by war bombardment and then post-war austerity which meant it was not completed until 1956. 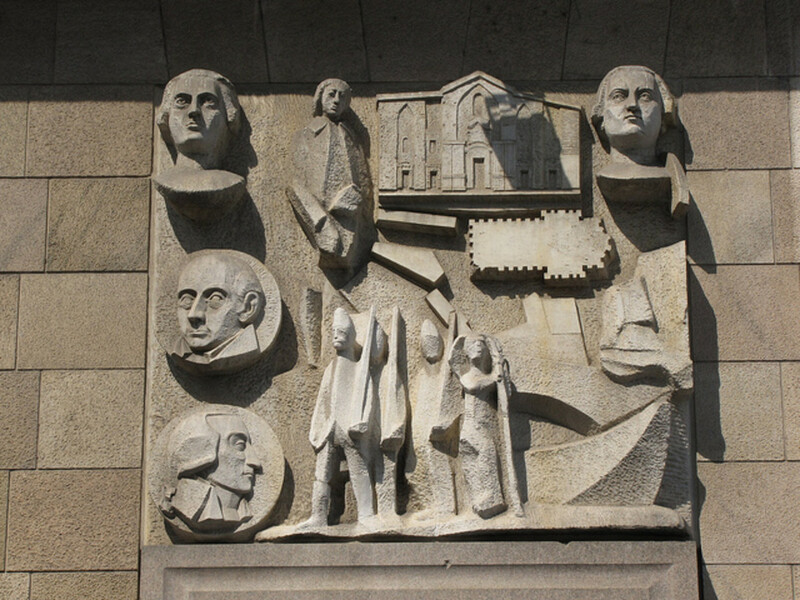 The lower facade is engraved with bas reliefs designed by the sculptor Arturo Martini who died in 1947. In the 21st century the Palazzo dell'Arengario was restored by a project carried out under architects Italo Rota and Fabio Fornasari. The museum itself was finally opened in 2010 with a remit to display examples of 'futurist' art which was the style of Martini. At street level, passing under the pillars, you encounter an interesting 'Mini-Guggenheim' of an ascending ramp enclosed behind a glass house. Crossing the road the building opposite follows the same external style. It also has a small, square courtyard underneath, open to the public and protected from the sun or the rain. You can sit outside the cafe and enjoy some food and drink with the ubiquitous aroma of Italian espresso in the air. Coming full circle we pass by the aforementioned Portici Meridionali and arrive at the Palazzo Carminati on the west side of the square. This lies opposite the equestrian statue which gazes permanently at its facade. For many years King Vittorio would have been aglow with a coat of many colours. Since the 1920s the buildings opposite had been clothed in the bright neon of large advertising signs akin to Times Square in New York or London's Piccadily. We have an ex-Mayor of Milan Gabriele Albertini to thank for their disappearance in 1999. He felt that the piazza deserved more dignity and after 70 years of luminous if not illustrious commercialism the beauty of the traditional architecture of the Carminati building was revealed once more. Gaudiness gives way to grandeur. And so ends our internet tour of Piazza Duomo leaving only time for a coffee underneath the Palazzo Carminati. Or perhaps some fast food as Burger King are still present on the west side of the square. McDonalds actually opened a new cafe nearby in 2013 offering free snacks to over 5,000 customers who queued up for the launch. But surely it is always advisable to sample the local fare and enjoy some soft focaccia, brioche or perhaps a toasted ciabatta or panino. Try some mozzarella cheese, proscuitto crudo or cotto in your sandwich to give that authentic taste of Italy with your coffee. Of course you can turn around and explore the wonderful interior of the Duomo itself. It has too many treasures to mention here and will be explained elsewhere. And if heights do not deter you then take that climb to the top. On a clear day you can have fantastic views of the Italian Alps. A view of which I am sure the golden statue of the Madonnina never tires of as she watches protectively over the city. 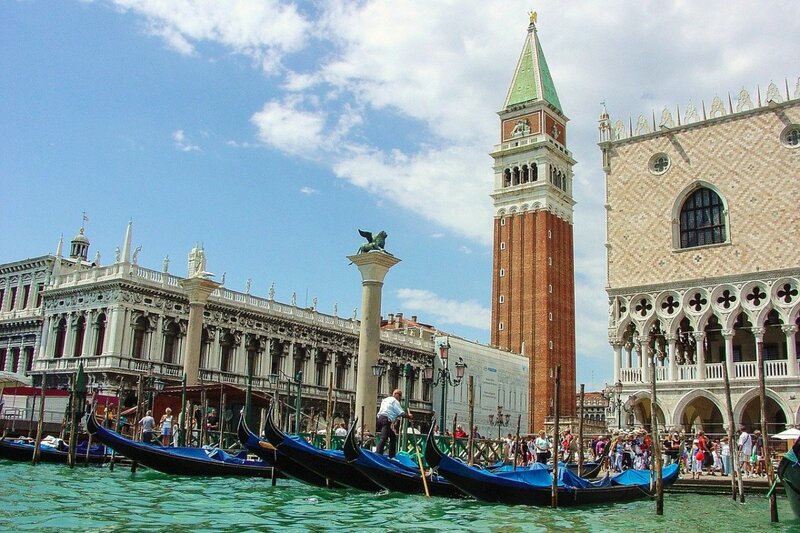 Wonderful, beautiful and beguiling - I will visit this city on my visit to Italy next year. 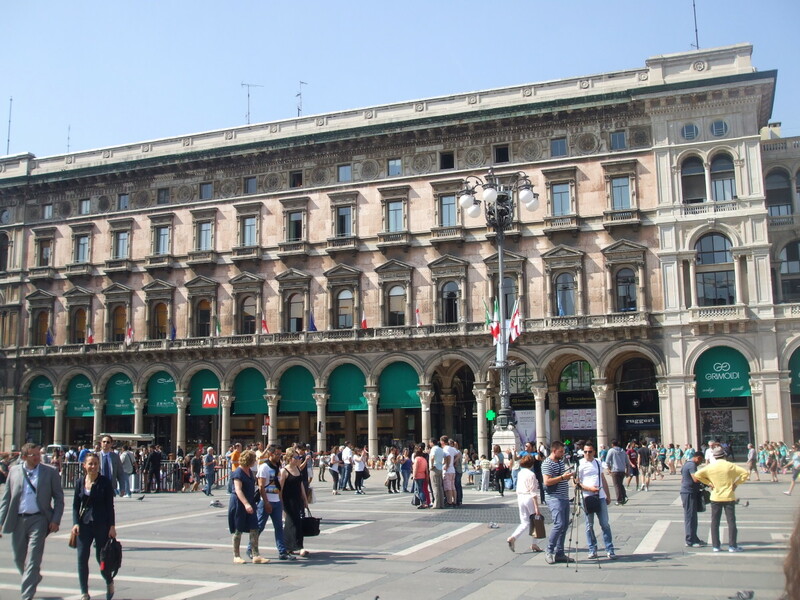 Wonderful information about Milan. Lovely photos as well. 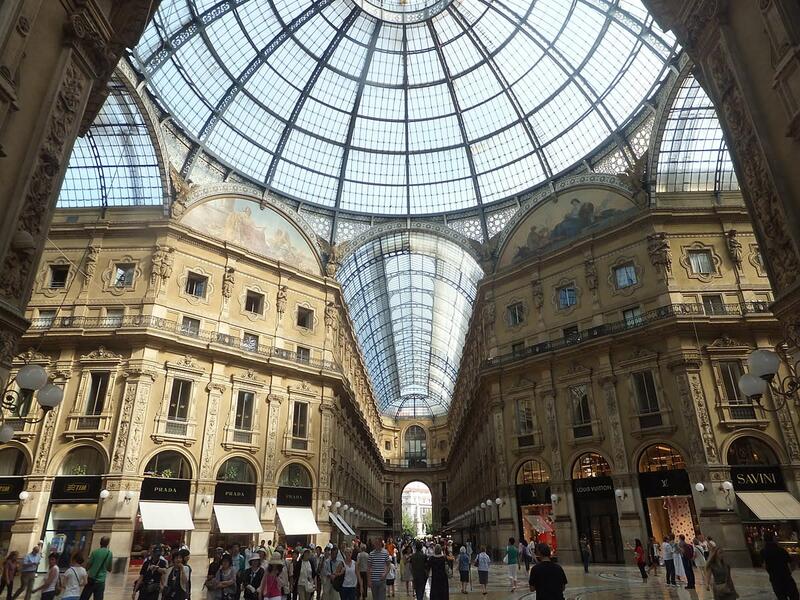 Milan is certainly worth a visit for a day as it has many hidden treasures. Eat at a Burger King in Milan? Never. Have a cup of cappuccino at a cafe? Ah, yes, in fact I can smell and taste it now. This is a beautiful presentation of a lovely city. When I drove through it the duomo was black, so they have really cleaned up the buildings since I was there years ago. Thanks so much for a fantastic tour of Milan. Great look at Milan. Italy is my favorite destination. Voted up and shared.